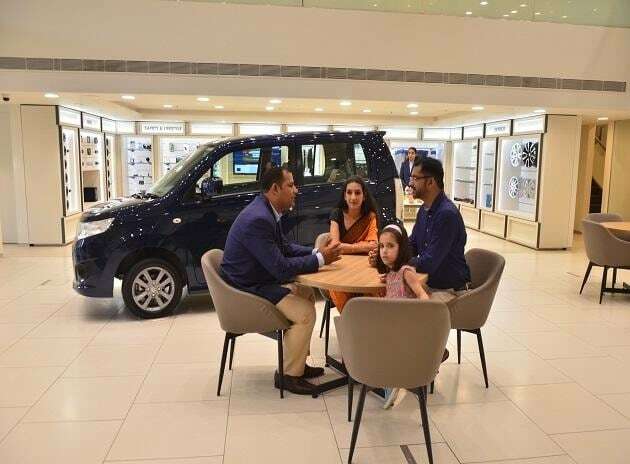 The car maker’s first ARENA dealership at Indraprastha metro station, Delhi After establishing Nexa as the dominant retail channel for selling premium vehicles, Maruti Suzuki is overhauling its distribution channel for mass market like Alto, WagonR and Swift. Showrooms for these models models will now operate under the brand Arena. The move to revamp its mass distribution network is driven by the need to give a signal to the mass buyer — who continues to drive volumes for the car maker — that she is as important to the company as the Nexa buyer. The company is hoping that a delightful consumer experience will help increase the ticket size for every walk-in. R.S. Kalsi, senior executive director, marketing and sales, Maruti Suzuki says that even as the company was rolling out the Nexa network in 2015, it faced questions such as whether the car maker’s existing customer base was not important to the company and why was a superior buying experience being extended to the new-age buyer alone? “Even during the Nexa network launch, we were clear that going forward, we would reinvent our product line and buying experience for customers opting for our mass products. Mass models account for 80 per cent of the company’s total sales – which is critical to sustain volumes. The customers in this segment are as important to us as Nexa buyers,” says Kalsi. The car maker has unveiled its first Arena showroom at the Indraprastha metro station, Delhi. 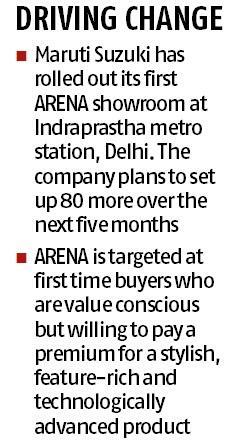 The company plans to set up another 80 Arena dealerships over the next five months. Currently, Maruti has 2,050 showrooms across 1,683 cities. Depending on the size and space, each Arena dealership would be redesigned or constructed anew at an average cost of Rs 1-1.5 crore. If Nexa was Maruti Suzuki’s gateway to reach out to an evolved and discerning customer who did not consider the car maker while scouting for a premium vehicle, Arena is targeted at first time buyers who are both demanding and value conscious and are willing to pay a premium for a more stylish, feature-rich and technologically advanced product. According to industry reports, about 75 per cent of the customers research online before purchasing a vehicle. Accordingly, Maruti Suzuki has designed the Arena showrooms to offer buyers a digitally-rich buying experience. Every Arena dealership would be equipped with a large touch screen display panel for customers to check out car specifications. It would offer buyers a 360 degree view of the car along with an iCreate configurator for vehicles like the Brezza and the Swift. Customers can reload pre-configured variations of cars that they might have customised on their own computers, iPads or phones directly onto the screen at the showrooms. Test drives would also be pre-registered online; for walk-in customers there are iPads mounted on entry desks. For Maruti Suzuki building Nexa showrooms was perhaps easier because all of of them were greenfield projects. That is, these dealerships were designed and built from scratch. However, developing Arena dealerships could turn out tricky as it involves reimagining up and running outlets as aspirational ones. Kalsi agrees that transforming these showrooms without disrupting operations would not be easy and the company is approaching the whole exercise cautiously. For Maruti Suzuki, speed is of the essence here. To ensure minimum disruption in the day to day operations of a showroom, the company is experimenting with modular designs and creating furniture and other essential fixtures offsite. Given that existing dealerships come in all sizes and are in varied locations, the car maker will offer customisation while staying true to the promise of delivering a more vibrant and engaging customer experience.